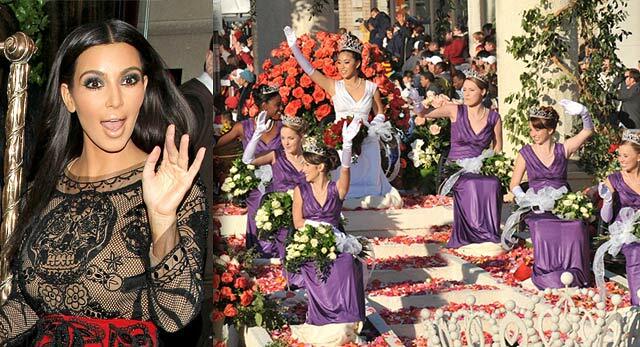 It seemed like the perfect setup: Kim Kardashian, proudly riding a float during the city of Glendale, California’s annual Rose Parade. Sadly, it won’t ever come to pass — at least, not this year. A Glendale city councilman has “pulled his request” for Kimmy to ride in the parade. Now the question is: Why? Why did Councilman Ara Najarian withdraw his invite? Is he upset with Kim K. about her recent, somewhat controversial trip to the Middle East? The short answer is no. Apparently, Kim Kardashian already has an appearance scheduled in Las Vegas, Nevada, on New Year’s Eve. That means there’s no way she could be in Glendale for the Rose Parade. This is probably for the best. According to a report in the Los Angeles Times, not everyone in Glendale was okay with a Kardashian riding in their famous parade. They’ve decided to voice their displeasure with Councilman Najarian by heckling him (which they did en masse during the Glendale Christmas Parade, apparently). Poor Kim Kardashian: It seems that no matter what she does or where she goes (or doesn’t go), she causes problems. Is it time for Kimmy to take a break from the spotlight during the holidays? Probably so, but don’t count on that happening, parades or not.